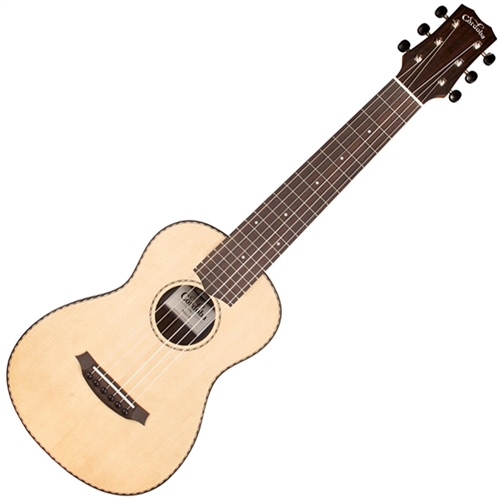 The Cordoba Mini R is the ultimate travel instrument, offering the playability of a full size nylon-string guitar in a compact, lightweight body with an impressively loud voice. This miniature guitar features a solid spruce top paired with rosewood back and sides for a deep, full tone. Its comfortable, thin U-shaped neck and 50mm nut width offers the feel and string spacing of a full-size guitar. It has a scale length of 510mm, and is tuned from A to A (ADGCEa). The Cordoba Mini R is a perfect companion for road trips, vacations, and hanging out at home. Includes a Cordoba gig bag. 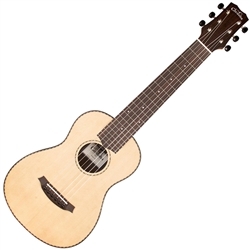 Cordoba C9-E Nylon-String Acoustic-Electric Guitar Cordoba CP100 Classical Guitar Pack - Natural Cordoba C7 SP/IN Acoustic Nylon String Classical Guitar - Natural Cordoba GK Studio Negra Left‑Handed - Natural "Blemished"